Baking these super easy gluten free sugar cookies in a low oven keeps the cookies pale and tender, without crisping the edges much at all. The result is perfect chewy sugar cookies, decorated or plain. Cookies: to drop or to roll? Whenever a reader who is new to baking, in general, asks where they should begin, I always suggest drop cookies. 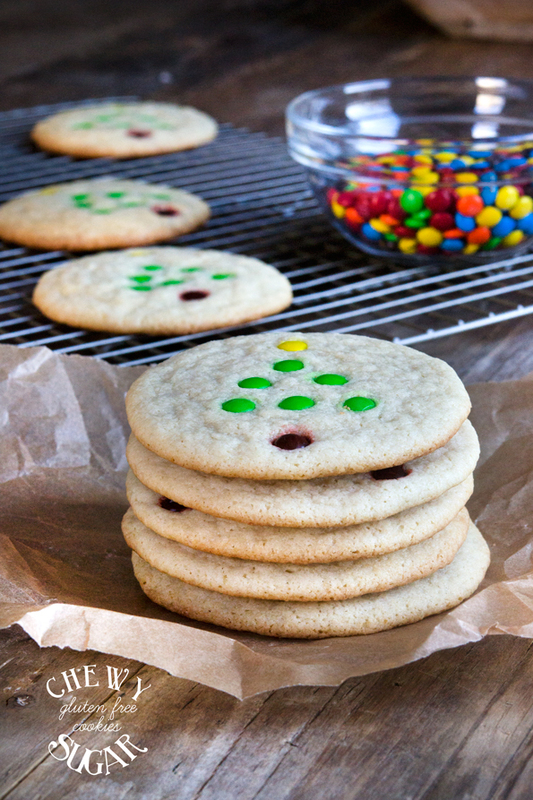 There’s nothing like rolling out dough and cutting it into shapes like you can with cutout sugar cookies, especially since they’re so easy to make festive for Easter or Christmas. But these chewy sugar cookies are so easy to throw together and shouldn’t make anyone who finds rolling out dough to be difficult or intimidating. I mean, I would love the chance to demystify rolling out pie crust and cutout cookies, but if you want to bake, I want to make you feel comfortable. And even though these are simple chewy sugar cookies that require no rolling or special equipment at all (not even a cookie cutter! ), they can still be decorated for any holiday. Christmas is easiest since a “tree” shape is simple with mini candies. Mini candy decoration would work for a red Valentine heart, too. The really deep colors (like red and brown) do bleed a bit more during baking. But if you wanted to decorate them for Easter, let’s say, you could still do it! 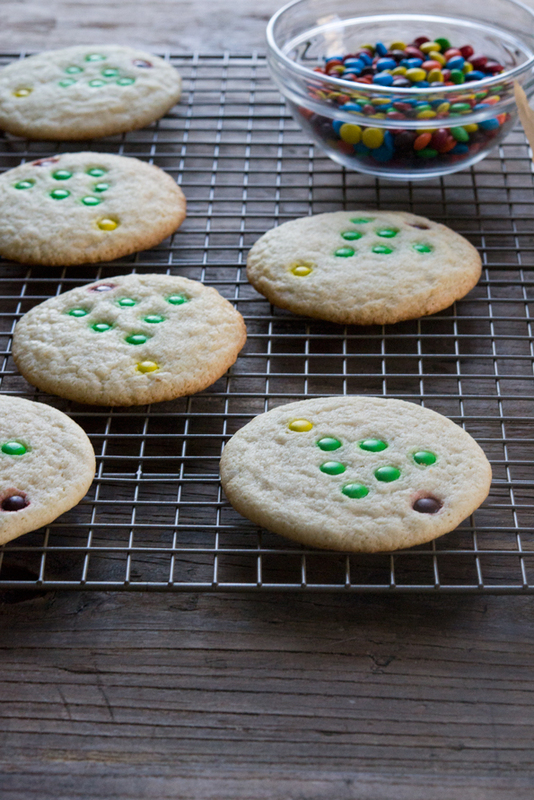 Just place a miniature Easter cookie cutter on top of the raw shaped dough and make a small indentation in the dough. Then, crush any hard candy and place the pieces in the mini cutter and carefully remove the cutter. When the dough bakes, the candy pieces will melt into the shape. I really like to bake these chewy little numbers in a very, very low oven (300°F) because that way they stay very pale in color. You could increase the baking temp to 325°F and bake them for a few minutes less, and they’ll brown a bit more and have crisp edges. Whatever you do, give them the proper amount of space to spread during baking. They’ll nearly double in size in the oven—unless you make them entirely dairy-free in the way I recommend below. Click play ▶ and watch me make them, then make a batch yourself! I’ve tested some substitutions, but not others. Where appropriate, these are just my best-educated guesses! Dairy-free: I have successfully made this recipe dairy-free! In place of the butter, I used Spectrum brand nonhydrogenated vegetable shortening gram for gram (so rather than 6 tablespoons of butter and 2 of shortening, I used 108 grams total shortening, melted and cooled). Since shortening has very little moisture and butter has a fair amount, I added 1 tablespoon of lukewarm water to the cookie dough. The cookies didn’t spread quite as much as the ones made with butter, but the chewy texture was spot-on. Egg-free: Since there’s only one egg in this recipe, a “chia egg” (1 tablespoon ground chia seeds + 1 tablespoon lukewarm water, mixed and allowed to gel) should work. Sugar: I do not recommend using a liquid sweetener like honey or maple syrup in place of refined granulated sugar. It just won’t work. Coconut palm sugar is also not a great idea since it doesn’t dissolve completely even when baked. If you’d like to make these entirely sugar-free, I recommend trying Truvia granulated sugar substitute. I do find that Truvia absorbs a lot of moisture, so I recommend adding some water until the cookie dough is the proper consistency (watch the video!). I’m afraid you’ll just have to experiment. Preheat your oven to 300°F (not a typo!). Line rimmed baking sheets with unbleached parchment paper and set them aside. In a large bowl, place the flour blend, xanthan gum, starch, baking soda, baking powder, salt, and sugar, and whisk to combine well. Create a well in the center of the dry ingredients, and add the butter, shortening, egg, and vanilla, and mix to combine. The dough will be thick and smooth, but easy to shape and not greasy. If it’s greasy and very soft, and you didn’t make any ingredient substitutions, it’s because the shortening wasn’t cooled. Just chill the dough briefly in the refrigerator, covered, until it’s easier to handle. Pull or scoop off pieces of dough about 1 1/2 tablespoons each, and roll into a ball (about 1-inch in diameter). Press each ball of dough into a disk about 3/8-inch thick, and place fully 2-inches apart from one another on the prepared baking sheets. The cookies will spread quite a lot during baking. Place the baking sheets in the freezer to chill until firm (about 5 minutes). Remove from the freezer, and decorate if desired. If you’re creating a design with something like miniature M&Ms (again, GF in the U.S.!) close to one another in the design, in the desired pattern, as they will separate from one another as the cookie spreads during baking. Place in the center of the preheated oven and bake until set in the center and starting to wrinkle a bit on top (about 14 minutes). Remove from the oven and allow to cool on the baking sheet for at least 10 minutes, or until stable, before transferring to a wire rack to cool completely. Originally published on the blog in 2013. Some photos original, most new, much of text and video all new. I use Bob’s Red Mill 1 to 1 Gluten Free Flour. Is this a high starch blend and will it be good for the sugar cookies? Hi, Carol, I do not recommend any of the Bob’s Red Mill blends. They are of very inconsistent quality, and the rice flour is very gritty. That means that the finished product is gritty—and that it doesn’t blend into the other ingredients properly. Sorry! I have some success using King Arthur gluten free all purpose and then adding xanthan gum. But I saw in one of your comments that you have recommended flours. Which are your “go-to’s”? Please click the link within the recipe attached to “all purpose gluten free flour,” which leads to my page with all my gluten free flour information. I always link to that page. I do not like King Arthur’s all purpose gluten free flour blend, I’m afraid, as it’s very, very starchy and therefore not properly balanced. Hi, Audra, my first guess is always that you made ingredient substitutions, especially with the flour blend. You must use one of my recommended flour blends, or the recipe simply won’t work. Not all flour blends are created equal. In addition to that, if you measured by volume instead of by weight, it’s almost impossible to measure accurately which leads to a less than ideal result. This is a very well-tested recipe that I’ve been making for over 5 years, and it will work when made as directed, I promise! I m new to this and do not need to cook gluten free. Can this be done with regular flour and omit the xanthan gum and kosher salt? How do u weigh an egg out of the shell? These sound and look so delicious! I can’t wait to try! Thank you! I’m afraid this blog is only for gluten free recipes, D.K., and I can’t help you convert to using conventional wheat-based flours at all. Sorry! What can I use to substitute the tapioca starch? What is it’s purpose? I am new to GF baking thanks! I discuss all that in the recipe itself, Tanya! These were wonderful. Thank you for this recipe. I cheated and used a cookie press, but they turned out perfect. You helped create a gluten-free holiday family tradition. These are so yummy! Just like my favorite Mrs. Field’s!! Usually I share my gf treats with my gluten eating bf but not these!! I bought the kindle version of your newest book, and am excited to try it out. I’ve ordered most of the starches and flours from amazon, and the expandex from Navan, so hopefully it’s all here soon. I’m picking up a kitchen scale today as well. I went to a cookie party last night and team GF was clearly represented. It was great. I would have liked these little numbers to take to the party last night. I will make them for Christmas Eve dinner instead! They are just too cute. I am Team Chewy. I do like crispy ginger bread cookies and speculoo (sp?). Thanks for this cute recipe Nik! I’m always glad that you include the weight of the egg. That helps us backyard chicken farmers! These are super cute! thanks for another recipe to add to my Christmas cookie list. Let’s open this up for debate: Are crunchy, chewy, or soft sugar cookies the best? My husband likes them super crunchy, which I think is a cookie travesty. I would vote for soft or chewy… probably soft, if forced to pick. Are people ready for Christmas? I’m not! I’m team crispy! My hubby team chewy…He always says that crispy cookies are stale and I always tell him there is no such thing as a “soft cookie” there is only an “under baked cookie”. We both agree that Snickerdoodles are perfect though. A bit crunchy with a bit of softness. Kinda counts as a sugar cookie, doesn’t it? I should point out that we’ve never TURNED DOWN a cookie because it was crunchy or soft.